This topic shows how to create a custom report design for an existing application business document by using a pure extension model. Microsoft Dynamics 365 for Finance and Operations includes an expanded set of tools to support custom solutions. This topic focuses on the steps for creating a custom report design for an existing application business document by using a pure extension model. Follow the steps later in this topic to associate a custom report design with an instance of an application document. When you've finished, users can configure Print management settings to select the custom design whenever it's appropriate, based on transaction details. The following illustration shows a typical application customization. Print management settings are scoped to the active legal entity. Custom designs can be associated with one or more Print management settings. Standard report designs continue to be available alongside custom solutions. Use Print management settings to select the appropriate design, based on transaction details. If you introduce a business document for a custom business process, more work is required. For more information about how to create a custom business document solution, see the Print Management Integration Guide. The following walkthrough shows the process of introducing a custom report design for an existing application business document and then using Print management to select the new design. The solution includes a custom design definition for the Sales confirmation report that is provided in the standard application as part of the Application Suite model. The application customizations will be defined in an extension model. 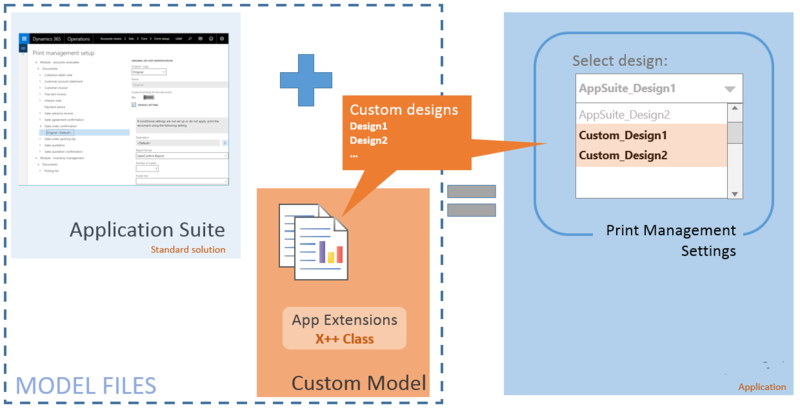 Create a new model for your application customizations. For more information about extension models, see Customization: Overlayering and extensions. For this example, you add a model that is named Application Suite Extensions, and that references the Application Suite, Application Platform, and Application Foundation packages. 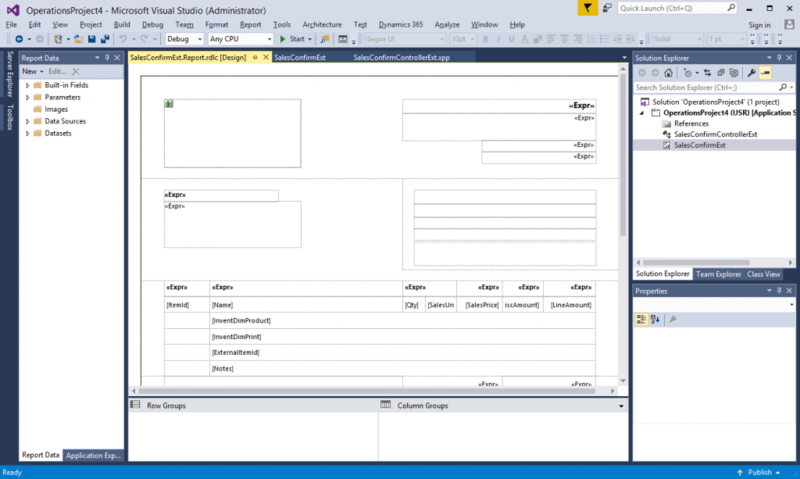 Create a new project in Microsoft Visual Studio. Make sure that the project is associated with your extension model. The following illustration shows the project settings. 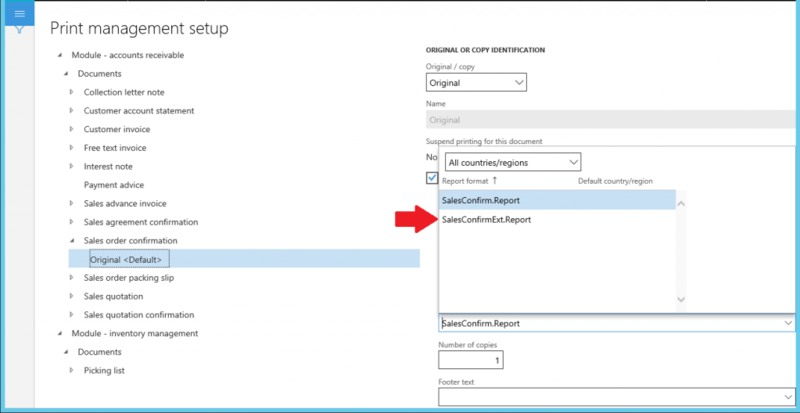 Create a custom report design for the business document. You must make sure that your custom solution consumes the correct report data contract. Find the existing Application Suite report in Application Explorer. This report is named SalesConfirm. Right-click it, and then click Duplicate in project to create the custom solution. Rename the report so that it has a meaningful name. For this example, name the custom report SalesConfirmExt to distinguish it from the standard solution. Compile the project, and deploy the report to verify that the changes have no errors. Use the free-form designer to customize the report design. Select the report design that is named Report, right-click it, and open the precision designer. Customize the design to satisfy the organization’s business requirements. The following illustration shows a custom design definition for the Sales confirmation report. Add a new X++ class that extends the standard report controller. Give the class a name that appropriately describes that it's a handler for an existing application report. For this example, rename the class SalesConfirmControllerExt to distinguish it from other report controllers. Use the extended class to load the custom design. Add a main method that refers to the custom report design. (You can just copy the main method from the standard solution and add references to the new Controller class.) Here is the code that extends the standard solution. Add a new report handler (X++) class to the project. Give the class a name that appropriately describes that it's a handler for Print management–based documents. For this example, rename the class PrintMgtDocTypeHandlerExt to distinguish it from other object handlers. Add a delegate handler method to start to use your custom report. In this example, extend the getDefaultReportFormatDelegate method in the PrintMgtDocTypeHandlerExt class by using the following code. Extend the menu item for the application report. 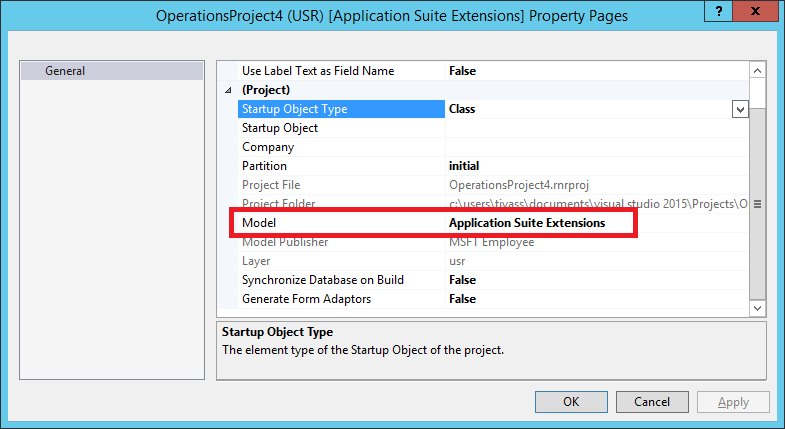 Find the existing Application Suite menu item in Application Explorer. This menu item is named SalesConfirmation. Right-click it, and then click Create extension. Open the new extension object in the designer, and set the value of the Object property to SalesConfirmControllerExt to redirect user navigations to the extended solution. Update the Print management settings to use the custom business document. For this example, go to Accounts receivable > Setup > Forms > Form setup. Click Print Management, find the document configuration settings, and then select the custom design. The following illustration shows the Print management settings after the changes have been compiled. You’ve now finished customizing the business document. Users will now be presented with the custom report design for the business document when they process transactions in the application.